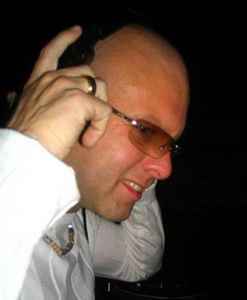 DJ and producer born in St. Maarten (Netherlands Antilles) on the 14th of March 1965, lived in the Netherlands, Curaçao and Aruba before going to College in US. On holidays to Aruba (home at that time) he was dj-ing in the biggest clubs on the island, being 17 years of age. In 1988 he started producer career. Founder of BPM Dance. This guy is clearly talented, now even though his earlier works are highly respected by me and used to be listened quite a few times, the unexpected, unique "Derb" is probably the apogee of Randy, it's very weird, but it works, don't get tired of it. I've known about Randy Katana for many years, as I heard his "In Silence" way back when I got Trancemaster 4003. However in the past few months, I've come to appreciate some of his less melodic work. Randy has a generous selection of Tech Trance productions which he churned out from 2003 up until 2007 when he took the slower Electro, Progressive and Tech House route. His Tribal influence is more apparent in many of his Tech Trance works. Some more than others, but there's always a hint of it. "One Solid Wave", "Another Wave" and "Plastic Fantastic", to name a few. I'm a big fan of Tribal and Latin rhythms but also of another Tech artist Mac Zimms (who, incidentally, has also collaborated with Katana), so this hybrid of styles really got me hooked. I have two particular favourites of Katana's... well, maybe three, but two of them are like twins. There's "Play It Loud", a hard hitting, euphoric techer with elements of Hard House and Trance, "Play It Louder", a more techy version of the former, featuring a famous sample just over half-way in, and finally, the Randy Katana Remix of Ron van den Beuken's dark Tech Trance opus "Access", in which the tribal presence is at it's strongest. As for the Minimal/Electro/Tech House mode Randy works in now, honourable mentions would have to be "Derb", "You & I" and "Bring It On" with Mac Zimms. I highly recommend this artist to fans of both the Tribal sounds and Tech Trance artists such as Sam Sharp, E-Craig and previously mentioned Mac Zimms. Perfect music for the dancefloors!